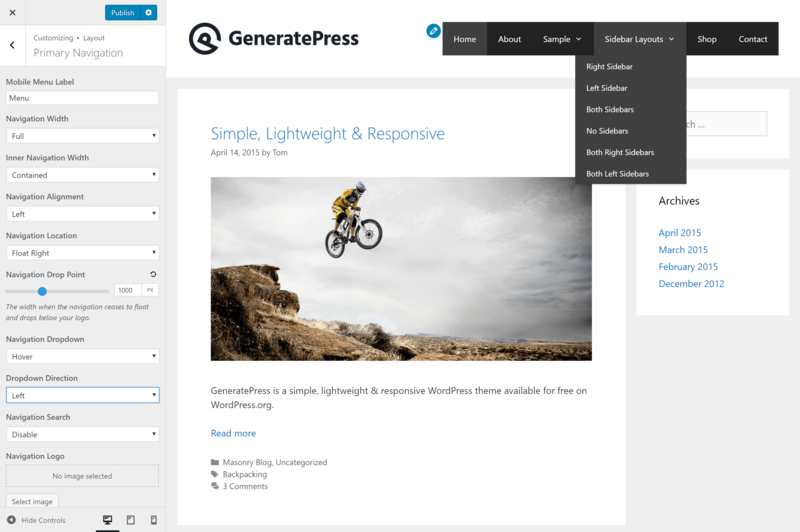 GeneratePress 2.2 is a very big feature release. Not only does it boast full compatibility with Gutenberg, but it includes lots of new free features built to save you time! Gutenberg is the current project name for the future block editor in WordPress 5.0, which is being released in the second half of November. I’m personally really excited about Gutenberg! It will allow for more complex layouts to be built without the need for plugins, shortcodes or page builders. In fact, we used Gutenberg in its infancy to re-design our current site. If you’d like to learn more about Gutenberg, check out this site. So, what has GeneratePress done when it comes to Gutenberg? The option to disable the content title has been a part of GeneratePress for a long time, but we wanted to make it easier on you while using the block editor. So, we added a toggle when you hover over your content title in the editor which you can click to disable the title. 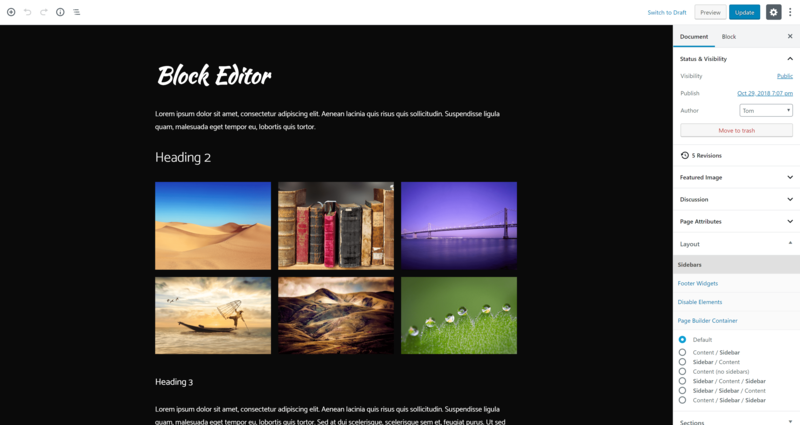 The block editor will inherit all of the styles from your content area. This means things like your font families (including Google Fonts), font sizes, background colors, and text colors will be visible as you build your page. This gives you a realistic view of what your page will look like when you’re done. Having an idea of how your content will look is important, so we’ve added logic to the editor that will set the width to what it will be on the live page. This width takes your sidebar layout into account, as well as your container width and your Page Builder Container settings. We’ve applied our own columns CSS to the columns block, which improves browser support and mobile responsiveness over what WordPress has done by default. We’ve also added your paragraph margin setting to the bottom of each block on the frontend of your site. This keeps spacing consistent throughout your content. Gutenberg adds a stylesheet to your site by default with all block styles. This makes us pretty sad, as we work hard to keep your site as light as possible. We experimented with removing their styles by default and adding our own, but decided it would be a compatibility nightmare in the future. However, they’re planning on only loading CSS used by blocks on your page, which will be a huge improvement that we’re looking forward to. So, that’s enough of Gutenberg for the moment. What else is new? One of the issues we see a lot is when the navigation is aligned right (or left), and the browser isn’t wide enough to fit the logo and navigation on one line. To combat this, we’ve added a new option which allows you to specify a width at which point the navigation will drop down onto its own line and center. You can now set the logo width directly inside the Customizer. This is great for creating retina logos, or even using SVG images as your logo. You can now change the direction of the sub-menu when you’re using a regular hover dropdown type. We’ve added a Customizer control to serve as a shortcut for specific header layouts. Like the Header Presets, we’ve added a Navigation Color Presets option to the Customizer. This option is helpful for free users so they’re not stuck with one color. It can also be a shortcut for premium users. This is a really big update. We’ve restructured our CSS completely, allowing us to actually reduce the filesize of style.min.css by 1kb, even with the Gutenberg additions. We’ve also rewritten various PHP functions throughout the theme to be cleaner and more organized. All microdata is now added via the new generate_do_microdata( $context ) function. This gives us better control over the added microdata (filterable), and allows us to turn it off completely using the generate_schema_type filter. If you’re using custom template files, you’ll want to make the above change when possible. This sounds incredible…I am so excited by this!! If I disable Gutenberg will that mean that the style sheet it sets is definitely not being added? I plan on using the Classic Editor plugins for myself and my clients until at least end of March 2019. Yes, if Gutenberg is disabled, their styles shouldn’t load. Hopefully they implement the ability to only load block CSS if they’re in use on the page soon. Installed 2.2 beta 1, and the integration of the styles into the editor is amazing! One thing, which I think might be more of a Gutenberg thing to change, is when you go to the Code Editor using the menu dots in the right top corner, the editor is – here – 387px wide, making is a very narrow column to edit in. Is this something that can be made wider following the front-end content width rules, so editing HTML is a tad easier? Those are some really extensive features, I’m really looking forward to version 2.2. In my opinion one of the biggest changes is the switch to JSON-LD. I am currently using GP Premium and have a custom template for product reviews that uses microdata information stored in custom fields (product rating, product name and so on). I’m very confused at this moment how I could still use this setup with JSON-LD. Again, the information changes on a per review basis and is retrieved from custom fields. Any ideas on how to best handle this would be greatly appreciated. Thank you for your reply, Tom. I think I can make it work, the Advanced Example in the documentation is really useful. So I could basically use the code from my custom review template directly in functions.php to retrieve and output the information using JSON-LD. I use the Toolset plugin for custom fields if it has any relevance. I was about to ask the same thing I see above, the code editor is very narrow, if you could add some css to the theme to make this 100% width this it would be great, it seems like all the editor styles have to be controlled by the theme, thanks! Are we talking about the HTML block, or any block when in code editing? The code editor for any block doesn’t appear to give us a class to alter the width with. However, we could force the HTML block to have a minimum width. I’m not seeing the option for the navigation drop point show up in my customizer. Is this feature implemented yet? Only in 2.2 when the navigation is set to float right or left. What’s the user case for the Header Presets control inside the Customizer feature? Is it to set a default header? Thanks! That control is just a shortcut to a few layouts you can achieve by changing a few different Customizer options. It basically changes multiple options for you automatically. We wanted to make sure we get it 100% right, so we’ve pushed it back to 2.3. I’ve been in contact with a schema expert who we’ll be working with to make sure we do it 100% correctly. Measure twice, cut once. We introduced a new filter which makes it so you can turn off the microdata in the HTML and use your own JSON-LD solution for now. I am crazy happy to see the Navigation Drop Point, Logo Width, and Sub Menu Direction settings. Those will all save so much time on the custom CSS work we put into nearly every site. Question: if we plan on running WP with Gutenberg disabled following the gutenberg update, will that cause any issues to consider inside GP? Definitely not! GP will continue to work just fine without Gutenberg, and we’ve only added a handful of lines of CSS for Gutenberg compatibility, so there’s minimal excess bloat. wonderful Tom. Thank you for your great jobs. – I don’t like Gutenberg. so I disabled it. And you have done the great way to reduce the codes. – I run Lighthouse to check the speed on my site, and there is one small problem. That’s the “generatepress.woff2”. I know that this is a very small file for the menu. But can we have any way to “not to load” this font? A small request would be to add the ability to change the navigation height for the drop point in the customizer. I currently use this which works fine, but could be an idea to add this functionality in the customizer. Thanks.